With more powerful boards sporting 32-bit micro-controllers, with more complex projects involving classes and libraries, a more powerful IDE is badly needed. Also, dealing with different boards means having as many IDEs as boards, even if all IDEs are Processing-based Wiring derived Arduino-like, the only difference being the colour of the interface! After having played with different boards platforms for a while, I was looking for one single IDE and a better one. I gave a try to cross-platform IDEs like Eclipse, NetBeans and Qt, but wasn't able to go far away. As a Mac user, I considered Xcode. Xcode is the official IDE from Apple for Mac OS X. It features all the modern niceties and a very nice interface. Adafruit, ArduCAM, Arduino, chipKIT and PICadillo, DFRobot, Digistump, ESP8266 and NodeMCU, Glowdeck, Intel Galileo and Edison, LaunchPad, LightBlue Bean, Little Robot Friends, Maple, MediaTek LinkIt, Microduino, Moteino, panStamp, Particle, RedBear, RFduino, Robotis, Simblee, Teensy, TinyCircuits, Udoo Neo and Wiring boards. The embedXcode+ template adds the object-oriented Cosa framework for AVR-based boards, the Yocto native applications and MCU programs on the Intel Edison board. embedXcode+ also brings self-documentation and external debugging. Just like embedXcode for Xcode on Mac OS X, Visual Micro is a plug-in for Visual Studio 2010 and 2012 on Windows. Visual Micro currently supports Arduino 0023 and 1.0 frameworks. 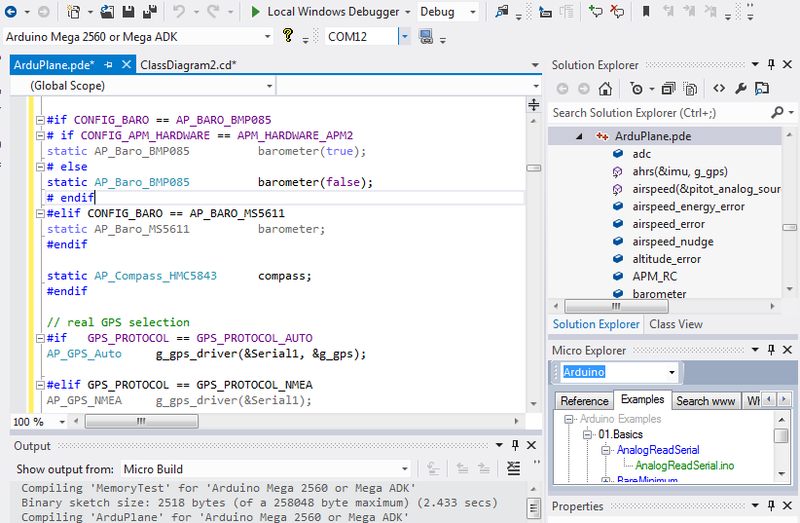 But Visual Micro goes further, as it includes a much asked for feature, an integrated software-based debugger.